Seven Vincentians are among 15 persons aboard a Grenada-registered vessel reported missing for two weeks. destination on Monday, December 6, but never arrived. According to a crew list from the ship’s agent, H C Shipping and Customs Agency, the missing Vincentians are Fitzroy Prince, Reinford Delpesche, Catherine Richardson, Lena Hazelwood, Cyril Alexander, Brenda Corke and Junior Polson. Coast Guard Commander David Robin, at a Press conference on Tuesday, said the Coast Guard Service was informed of the missing vessel last week Thursday when Candice Corke, of Sion Hill, the daughter of one of the passengers made an initial report. He said Corke stated she had received information that the vessel had experienced engine problems was docked in Dominica. Commander Robin said checks were made with Dominican authorities but the whereabouts of the vessel remain unknown. He also said the Coast Guard Service had embarked on a routine process of informing other services in the region about the missing vessel and investigations are continuing. Robin, however, expressed concern that the Coast Guard Service was informed about the vessel only three days after it failed to arrive at its destination. He said he had always maintained that ship operators report their position to lighthouses along their routes. Robin also expressed concern about the manner in which the Coast Guard Service was informed. He stressed that the initial information was raised by an individual concerned that the vessel, carrying her diabetic mother, had not arrived at its destination. In an interview at her Mala Village home Wednesday morning, 20-year-old Candice Corke said she first became concerned about her mother, Brenda, on Tuesday, December 7. She explained that her 50-year-old mother travelled twice monthly to St. Maarten and then to Anguilla to sell agricultural produce. She said the boat usually leaves around 8 p.m. on Saturdays and would arrive around 5 p.m. on Mondays. “We asked people in St. Maarten to see if the boat reached in port, but every time they said no,” Corke stated. Corke said her diabetic mother usually walked with just enough medication to serve her until she returns home. Meanwhile, Corke has expressed dissatisfaction with the manner in which the situation has been handled. “I am not satisfied at all with the Coast Guard Service. I think if they had sent out a plane they [passengers] would have been here,” she stated. 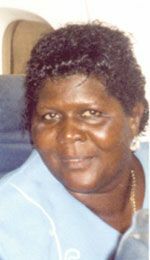 Corke also said the last information she had from the shipping agent was that the vessel was seen being towed to Dominica.